So I've been dreading posting this week's kindergarten lesson because I've literally changed it up every single rotation (still trying to get it so that I'm 100% happy with it -- hahaha like that will EVER happen). We start off by reading the book "Mouse Paint" by Ellen Stoll Walsh and then transition to looking at a PowerPoint on the projector which reiterates the ideas of primary colors mixing to create secondary colors. 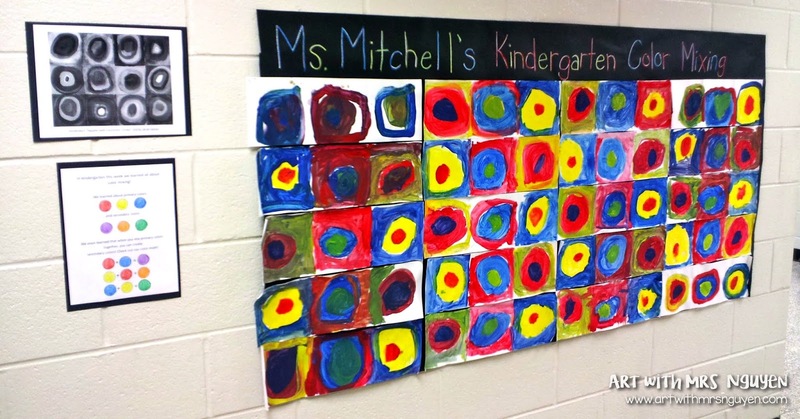 Then we look at artwork by a variety of artists and talk about their color choices. Finally, we end on Kandinsky's "Squares with Concentric Circles" (1913) and talk about all the colors he used and how he could have made them. I then have students go back to their seats and using crayon, they practice drawing rainbow concentric circles! The next day they come in we are ready to paint! I only give them red, yellow, and blue tempera paints. 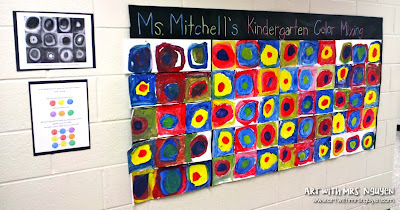 Inspired by the Kandinsky painting, my kinders get experience mixing colors on their papers by following my step-by-step demonstration. I do this lesson VERY directed for two reasons. 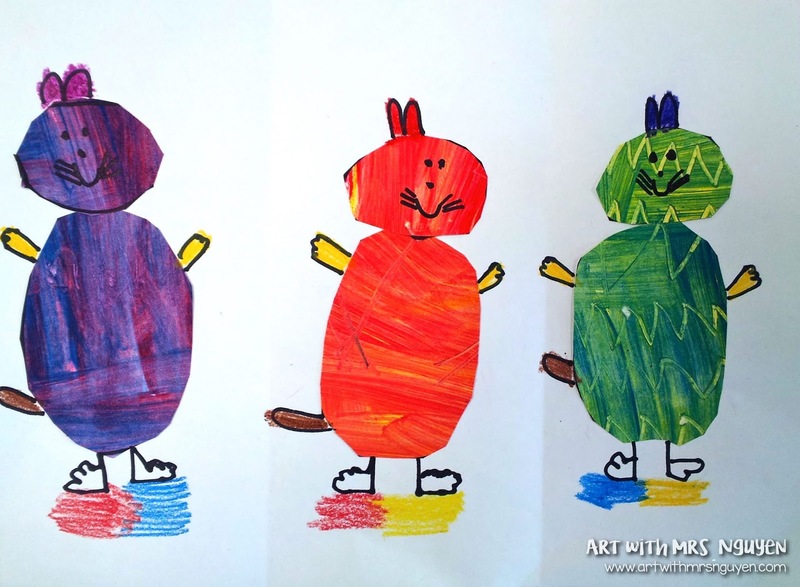 #1 - This is my first time painting with tempera with my kinders and I want to see how well they can handle the materials and following painting procedures. #2 - I want all of my kinders to have success (at least once in my classroom) mixing all three secondary colors on their papers. The next day they come in I let them have a little more freedom in their paintings. All I asked was that they mix all three secondary colors on their papers using primary-colored tempera paint. Once their paper was painted, they used popsicle sticks to "draw" anything they wanted in their paint (patterns, shapes, letters, pictures, etc). Now here is where I've really varied my approach. 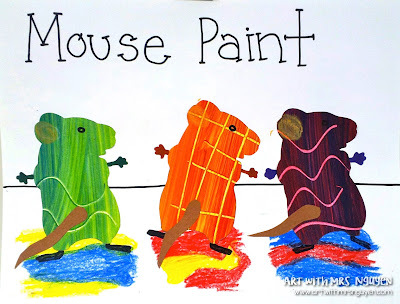 I originally wanted to use the painted paper they created to cut out mice shapes (inspired by the book Mouse Paint) and have them "splashing" in the correct primary colored puddles - HOWEVER this is not how it worked out each time. I've ended up going in a few different directions with this.. so feel free to check out the images below. Drawing mice directly onto painted paper. Cutting out body parts from painted paper. 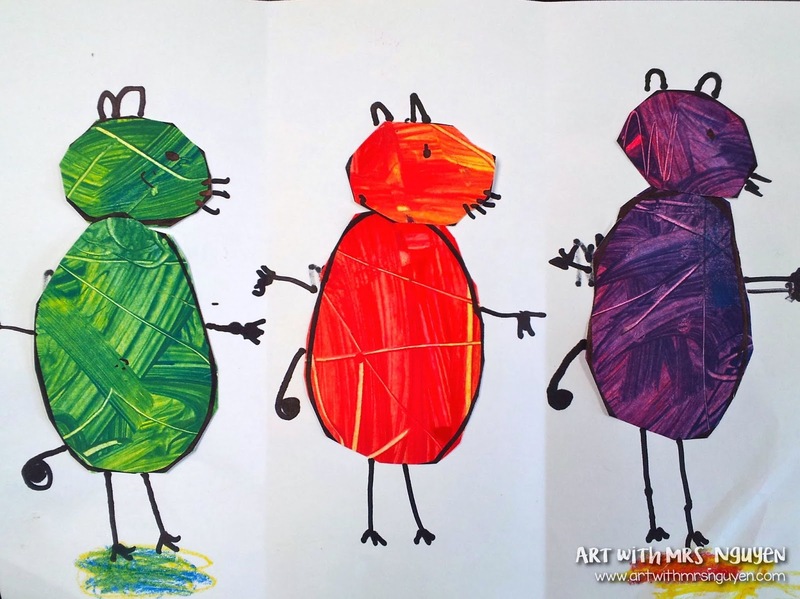 Drawing out the mice on a separate piece of paper and then gluing them down onto the painted paper. What made you decide to change it up? Cutting out the shapes for the bodies looks the best. It was a combination of time and student ability. Some of my kinder classes could really handle cutting out the shapes in a timely manner.. while others could not.